After my transplant from Connecticut to the Dallas area twenty-eight years ago, I’ve tip-toed around the Southern idea of cooked “greens”, but other than cooking kale occasionally never really developed an interest. However, in a recent search for a non-dairy source of calcium for aging bones, I found that greens such as collards are a great source of this mineral as well as other complementary vitamins K and A. Collards are one of the cruciferous vegetables in addition to the better known and more consumed broccoli, kale, and cabbage. These greens have great cholesterol-lowering, anti-cancer, antioxidant, and anti-inflammatory benefits. Good for your heart, good for your bones, now how to make them good to eat! I found a great cookbook called Greens Glorious Greens! by Johnna Albi and Catherine Walthers with great information, specific preparation and cooking directions, and great recipes for over thirty of these leafy greens—from arugula to wild greens such as chicory and dandelion. 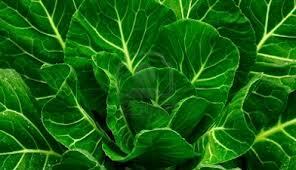 These authors, as well as Whole Foods website, the world’s healthiest foods ,call collards a nutritional goldmine. But one more obstacle before plunging into my exploration of greens—my Dallas-born husband who dislikes cooked greens. So with a promise of corn muffins and BBQ chicken, I made the following recipe, which is adapted from Greens Glorious Greens! 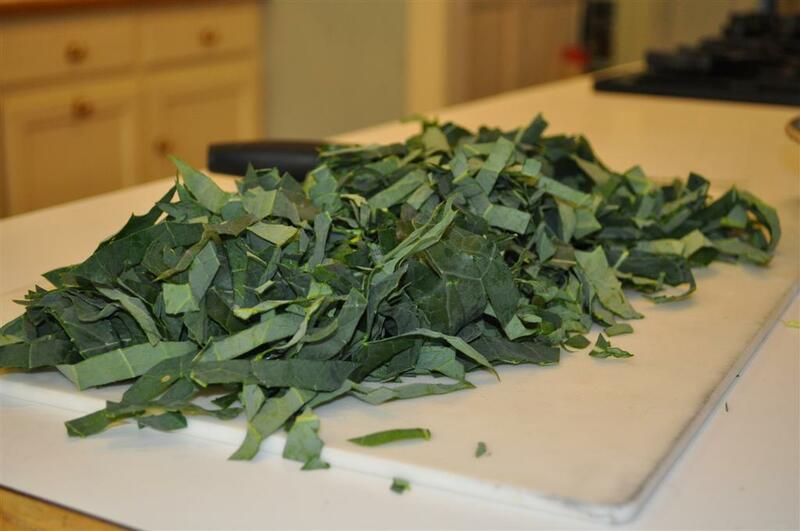 Wash collards, remove stalks, and cut leaves in half. Stack 5 to 6 leaves together and slice into ¼ inch strips. Set aside. In large, deep skillet (or cast-iron pan) heat olive oil, add onions, and sauté for 15 minutes. Add agave (or sugar) to onion and continue to stir for 2 to 3 minute. Add garlic and sauté for another 2-3 minutes. While the onions are cooking, bring 3 cups of water to a boil in a 12-inch skillet with a lid. Add collards, cover, and cook at a good boil for 8 to 10 minutes, stirring occasionally. The greens are bright green, but tender, when ready. Drain in colander. Stir greens into onions and garlic. Season with salt and cook for 2 to 3 minutes until heated through, Serves 3 to 4. Adapted from Greens Glorious Greens, page 118. A great new vegetable recipe to add to my collection, and—yes—my husband did eat all his greens. Posted in Recipe, Vegetable Gardening in Dallas, Winter and tagged Collard Greens, Dallas Farm to Table, dallas gardens, garden recipe, vegetarian. Bookmark the permalink.